If you fancy Live Roulette, you are going to be a lucky player. Every day from 8:00pm to 9:00pm you have the chance to win 8 extra Pounds. Take your seat in the 888casino Private Room and gamble on Live Roulette. Place a bet of minimum 8 Pounds during event hours and get ready to win some money. If the ball lands on the number 8, you will be rewarded with a bonus of 8 Pounds. Benefit from your extra cash and gamble your money wisely! As soon as you get your bonus notification you should claim your money within 7 days. Use it quickly before it expires. Winnings are part of the gambling experience so if you managed to score some, you probably want to withdraw them. Wager your cash 30 times before you can make any withdrawals. 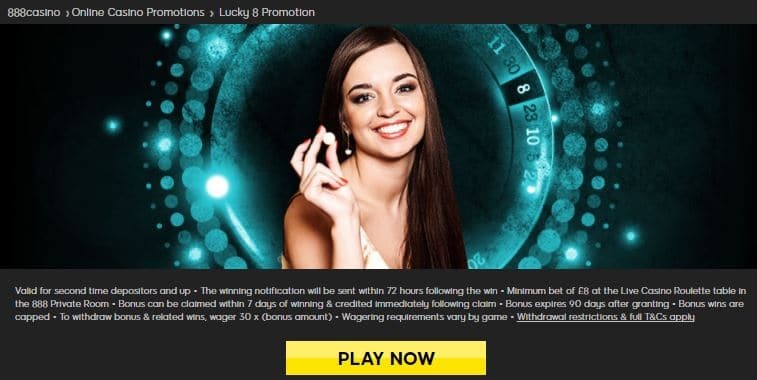 Try your luck on live Roulette! Play right now and enjoy the bonus!